In recent years, I have read many investment articles and heard many financial advisors stating that investing in guaranteed investment certificates (GICs) and fixed income products is not a good choice because the after-tax yield is lower than inflation. Such investors will see their purchasing power eroded over time. On May 19, 2015, the Bank of Canada Governor, Stephen Poloz, gave a speech at the Greater Charlottetown Chamber Of Commerce Annual President’s Luncheon. During the question and answer session, I indicated to the Governor that it was difficult to provide advice with respect to retirement planning when inflation rates and interest rates were almost the same. For retirees, investments should be more conservative, meaning a high percentage of fixed income securities. However, the current situation presents challenges in telling retirement age how to invest. I asked if he had any advice he could provide to me in this respect. The response to my question was along the lines of, “When the Canadian economy returns to full production, we would expect bond yields to return to being closer to their long-term position of 4%.” Since the Bank of Canada target inflation rate is 2%, at that time, interest yields would keep up with inflation again. However, in the meantime, some financial advisors are telling their clients that, “Everyone needs to invest some portion of their portfolio in equities to keep up with inflation.” Of course, investment advisors make very little money if people are not buying, selling or staying in the stock market. Commissions on guaranteed investment certificate (GIC) are minimal, maybe 0.25% of the purchase cost, whereas commissions on equities can easily provide 1% per year of the value invested. 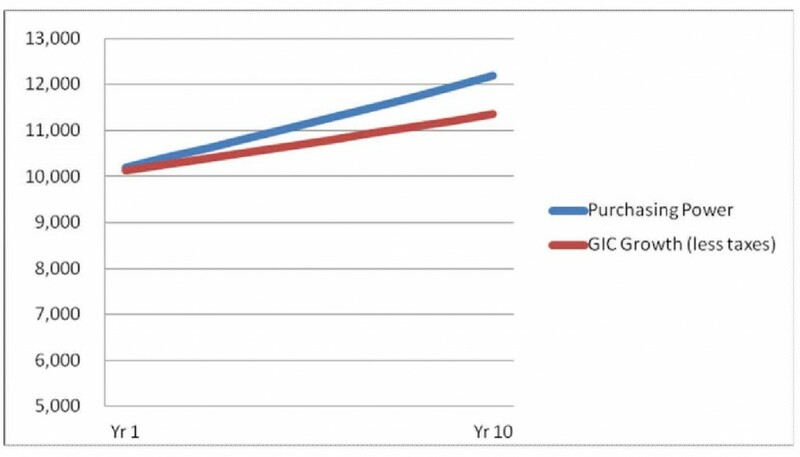 So, selling a GIC for $100,000 may pay them $25.00, while selling a stock or mutual fund for $100,000 could pay them $1,000 per year plus the buying commission. This difference will not impact the recommendation of a professional advisor acting in your best interests, but for those other advisors…?! Investing your current savings in GICs, combined with a regular savings plan. Assume we can make a 2% yield on GICs or bonds by using a laddered portfolio, with all interest reinvested annually. A laddered portfolio is an investment in securities with five year terms allocated so that an equal amount matures in each of the five years. 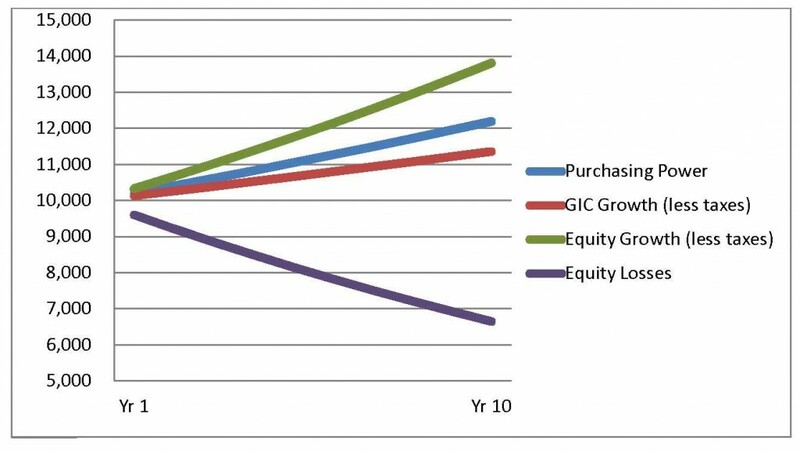 For example, a $10,000 GIC portfolio would have five GICs of $2,000 with one GIC maturing in each of years one through five. Upon each maturity, the amount is reinvested for a further five years. Therefore, you are receiving a moving average of five year interest rates, which are typically (but not always) the highest rates. This should not be difficult to set up. Also assume that inflation remains at 2%. One final assumption is that you have a tax rate of 36%. This would be typical of a middle income tax bracket with taxable income in the range of $45,000 to $90,000 in my home province of PEI at the moment. It will vary depending in which province you live. In this scenario, after income taxes, you would be making 1.28% from your interest income. How much will you fall behind if inflation and interest rates both remain at 2%? If you spend $50,000 per year, about average for a household in PEI, you would need $51,000 after one year because of inflation. With interest of 2%, less taxes of 36%, your $50,000 investment would only grow to $50,640, leaving you $360 short ($1.00 per day) to meet your expenses. Now, put this in context – is that such a high number that you need to put your money in the stock market? Yes, this is cumulative, and it needs to be considered, but let’s explore further. 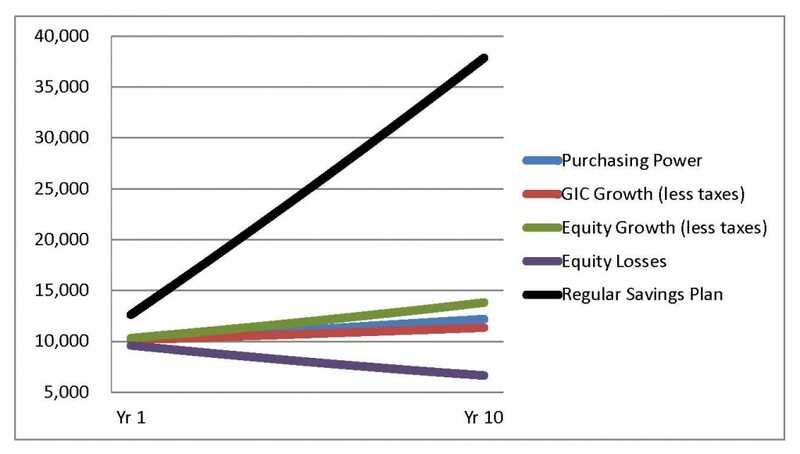 Let us look at the impact on a $10,000 investment over 10 years. The results are presented in Chart 1 below. If the cost of a product or service is $10,000 today, the price will grow to $12,190 at 2% inflation (which would equal the GIC before income taxes). After taxes, your $10,000 GIC would grow to be worth $11,356 – a loss of $834 of purchasing power. This is the difference in year 10 between the red and blue chart lines in Chart 1. Now, let’s look at investing in the stock market. The Financial Planning Standards Council of Canada issued Projection Assumption Guidelines on April 30, 2015 suggesting appropriate assumptions for retirement planning. They recommended a return of 3.7% for an aggressive portfolio containing 75% equities (including dividends and capital gains but net of advisor fees). I have assumed a return rate of 4%. Taxes on income from equities tend to be lower than on interest because Canadian dividends (not foreign dividends) receive a dividend tax credit, and only one-half of capital gains are taxed. I have assumed a tax rate of 18%, being one-half of my assumption for taxes on interest. In Chart 2, I have added two lines – the green line shows the performance of the equities based on the 4% return, but I thought it worthwhile to also warn you that you can lose money in the stock market. Hence, see the impact of a loss of 4% per year by looking at the purple line. I have no basis for using this rate – it is just to demonstrate that there is risk of losing more than inflation if you make incorrect stock market purchases. Clearly, Chart 2 shows that equity investing can potentially protect you from inflation. With the 4% returns over 10 years, your investment would grow to $13,809 after taxes. The cost of your $10,000 of products would have increased to $12,190 at that time. You need to decide whether the risk of investing in the market is worth the increase in purchasing power of $2,453 above that of a safe GIC, which would only have grown to $11,356..
Now, I want to show one safe way to plan for inflation. Use this same approach to plan for any future needs, such as unexpected expenses, education funding for children or retirement. Look at your current income. Consider your hourly rate of pay, your monthly pension cheque or the amount you spend every week on “fun or unnecessary stuff.” Can you save $7 a day, which is $50 per week and about $2,500 per year? Let’s assume you do this throughout a ten-year period. At the end of each year, you invest the money in a 2% GIC. Add this to your starting position of $10,000. Look at the difference in Chart 3 that such a simple savings plan has on your net worth compared to all of the other scenarios. You will have $37,847 saved, which is over $24,000 more than just making a choice on how to invest your current savings. The regular amount you save has far more impact than your rate your rate of return. I am trying to point out that regular savings is the most important part of your investment plan. Save for the future, and inflation at 2% will be a very small worry. A rule of thumb for people still working is to save 5% to 10% of their net pay cheque by using an automatic savings plan. Look at your income and look at your spending habits to choose an amount appropriate for you. Saving money is important at all ages if you have concerns about the future. Setting up a routine to automatically transfer money from your chequing account to a savings account, and then investing it at least once a year, is in your best interests. Of course, this article is about protecting you from inflation in the future. If you have debts to pay and other financial concerns, you need to speak to a professional financial planner to get your financial life organized. To conclude, I will provide you with some common sense reminders. Save some money on a regular basis and avoid loans and debts other than your house mortgage, student loans and perhaps a car loan (if you need one to get to work). Buy things only when you can afford to do so. Do not buy investments that you do not understand. Do not take risks in the stock market (mutual funds or other investments) if you cannot afford to lose any money. Money invested in the stock market should be money you will not need within the next seven to ten years, allowing time for the market to rebound when it crashes. If someone tells you that you need to take risk because you need to make more money, then what you really need is another opinion. Ask lots of questions of your advisors – their job is to answer them in a way you understand. Read my other articles on investing for more information. Finally, get advice from a professional and qualified financial planner. If you are afraid of the stock market, a good planner will design a plan for you by suggesting other adjustments to your lifestyle and savings plans.